I finally realized why I dislike Boston sports teams so much. It’s gotten so bad that my favorite team each week happens to be whoever beats the Pats, Celtics, or Red Sox. Super Bowl XXXVI - One of the most painful sports memories of my life. I’ve posted on my Boston-hating before, and although I mentioned that it was the fans who elicited the hater-ade, I took some time to reflect and came to an altogether different conclusion. Yet another reason for folks to practice pausing via the daily office. Basically, Boston has owned all my teams in the recent past. LA Angels – Lost to the Red Sox in 2004, 2007, and 2008. We finally beat them this year, but they promptly snatched up our ace, John Lackey, in the offseason. St. Louis Rams – To those of you who don’t know, I’ve been a Rams fan since I was in the 5th grade and the team was in LA. My favorite player was Jim Everett growing up, and I would get teased about wearing a Jim Everett shirt to school every day. Most of the teasing came from my twin brother Peter, but whatever. 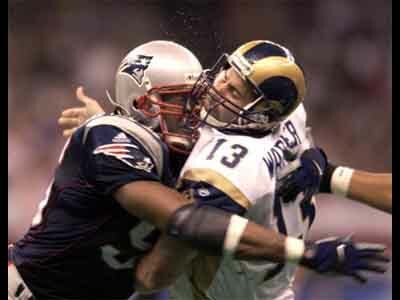 The Rams lost to the Pats in one of the most heartbreaking games of my life, Super Bowl XXXVI. The Rams were heavy favorites, and Kurt Warner, my favorite player at the time, was coming off an MVP season. We lost on a last second 48 yard field goal by Viniateri, and the legend of Tom Brady was born. This is how ridiculous my anger was – I was so mad that I kept blaming the refs from the playoff game the Pats had with the Raiders before the Super Bowl, the one in which the tuck rule allowed the Pats to keep the ball and eventually win the game. Can you believe that? I was blaming the refs from the previous game which allowed the Pats to play in the Super Bowl. Yes, I am a bitter man. LA Lakers – My allegiance to the Lakers has shifted to the Clippers (insert joke or tease from audience here), but of course I rooted for the Lakers in my earlier years, and most recently, when the Lakers played the Celtics in 2008, I was totally rooting for the Lakers. Sure enough, they got manhandled by the Celtics. It was embarrassing. I remember watching the final game at Tim and Flerida’s, and they promptly got beat by 4,567 points. So there you have it. That’s why my level of hater-ade has risen in the recent past. I need to listen to some Taylor Swift to cheer me up. the redsocks are going to regret signing lackey to a long term contract.